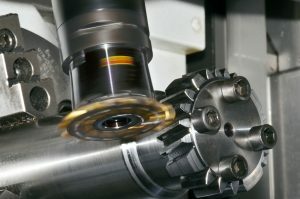 The following technical paper from Gleason describes the Cyclocut process for advanced cutting, skiving, and semi-completing of bevel gears in low quantities. 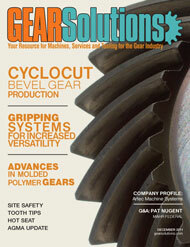 Low-quantity bevel gearsets can be manufactured with the Cyclo-Palloid® method. 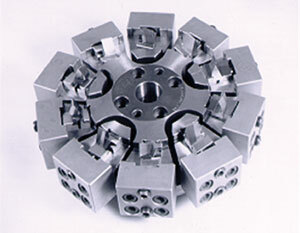 The Cyclo-Palloid uses interlocking face hobbing cutters with five starts in most cases. For the soft cutting, each cutter start includes separate outside and inside roughing and finishing blades. Figure 1 shows an interlocking Cyclo-Palloid cutter head where the center part carries an inside roughing blade and an outside finishing blade. The interlocking second part of the cutter carries the outside blades. The cutter as shown in Figure 1 is set up for the soft cutting operation. The same cutter head can be used for hard finishing by skiving. The finishing blades are replaced by skiving blades, which commonly have brazed on CBN (cubical boron nitride) inserts on the cutting edges. The roughing blade slots are not used during the skiving operation. Cyclo-Palloid is a continuous indexing face hobbing method with parallel depth teeth that is based on conjugacy. This means without any flank corrections the pinion and gear flanks would contact along contact lines in every roll position. 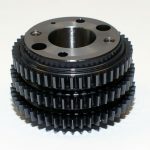 While rolling through an entire tooth mesh, the transmission ratio in case of conjugacy is perfectly constant and equal to the ratio of the pinion and gear tooth count. 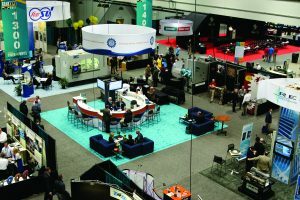 The motivation to use two-part interlocking cutters is based on the idea of applying a mathematically simple method to generate length crowning by combining nominal inside blade diameters with outside blade diameters that are larger than nominal. The enlarged outside blade radii generate outside flanks that, in interaction with the nominal inside outside flanks, will lead to length crowning controlled by the amount of outside blade point diameter increase. The graphic in Figure 2 shows how the two different pitch point diameters are arranged to be approximately tangential in the center roll position at the tooth mid-face. In order to accomplish the correct position of the two interlocking cutter parts, a main (outer) spindle carries the outer cutter part, while the inner cutter part is connected to a secondary (inner) spindle. The secondary spindle is positioned at an eccentric position relative to the main spindle, such that the two pitch point circles contact each other at the calculation point in mid-face position and the offset lines of both cutter parts lie on top of each other and are perpendicular to the flank line tangent (Figure 2). 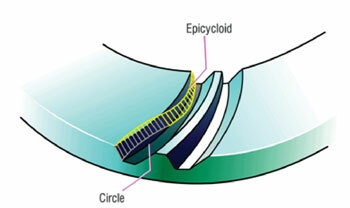 Profile crowning in Cyclo-Palloid is generated with curved blade cutting edges. 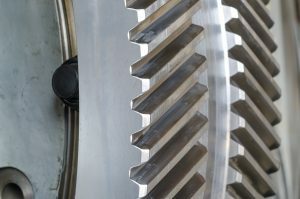 Both pinion and gear are strictly generated bevel gears; there is no non-generated version of Cyclo-Palloid available . 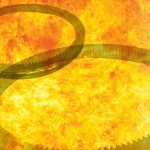 A hypoid offset of the pinion versus the gear is basically possible, but very seldom used in practical applications. Interlocking face cutters are time consuming to build and have lower stiffness than single part cutters. Also, the provisions on the machine of a main spindle with an adjustable secondary spindle inside requires a complex design and results in reduced stiffness. Cyclocut™ successfully replaces the interlocking cutter with a single part cutter, which can be used on freeform Phoenix® II bevel gear generators in order to produce gears with flank surfaces that match Cyclo-Palloid flanks. Length crowning is generated with single part cutters (in a completing process) by utilizing a cutter head tilt as shown in Figure 3. The untilted cutter to the left requires two cutter parts, rotating about different cutter axes (∆ρ), like the case in Cyclo-Palloid. It is also possible to tilt a single part cutter about the mid-face flank line tangent and adjust the blade angle by the same amount to achieve identical curvature radii as in the case of different cutter axes for inside and outside blades. The mentioned blade angle adjustment also assures the correct pressure angles on both flanks. Figure 4 shows a comparison of a simulated tooth contact analysis based on the Cyclo-Palloid cutters and machine kinematics to the left and based on the single part Cyclocut cutter and machine kinematics to the right. 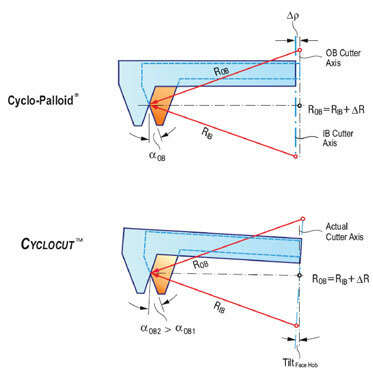 Ease-off, tooth contact, and motion error between Cyclo-Palloid and Cyclocut show the identical characteristics. 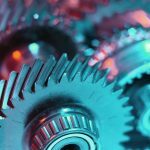 Practical trials proved that Cyclo-Palloid pinions can roll with Cyclocut gears and vice-versa without significant differences in contact patterns and rolling characteristics . The first generation Cyclocut cutter head (shown in Figure 5 to the left) used rectangular blade sticks and was mostly applied to wet cutting with HSS (high speed steel) blades. 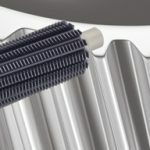 The second generation Cyclocut cutters (Figure 5, right) utilizes five-sided Pentac® slots that provide a positive seating which is beneficial for all applications of carbide blades . Pentac blades eliminate basically all micro-movement of the blades in the cutter head slot, which is important in order to reduce or eliminate cutting edge chipping. The machining process for soft cutting is a standard face hobbing cycle with a center plunge and double roll cycle. In order to maximize tool life, the center plunge utilizes a vector feed  in order to balance cutting edge wear between inside and outside blades. The preferred hard finishing after heat treatment is skiving. In Cyclocut, the soft cutting prepares the root geometry for the following skiving process with a root skiving distance, a flank stock allowance, and a protuberance between flank and root fillet radius. Figure 6 shows those three geometric elements that are standard features of Cyclocut . Cyclocut skiving is a hard cutting process that utilizes coated carbide blades with a chip-forming facet that has a 20° negative side rake angle (T-Land in Figure 7). In the skiving process the blade cutting edge is required to develop a high normal force contact with the flank surface in order to penetrate into the hardened steel and form a chip. 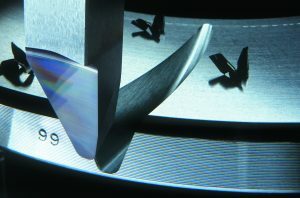 The same Pentac cutter as shown in Figure 5 for the previous soft cutting is used for the skiving only the soft cutting blades are exchanged with skiving blades. It is very advantageous to use single-part Pentac cutters instead of interlocking cutters mounted to a double spindle because of the high stiffness requirement between work and tool in the case of skiving. 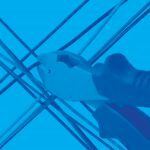 Cyclocut skiving is performed at surface speeds of 120 m/min and removes chip thicknesses of 0.1mm, which is equivalent to an end chip value of 0.34mm. A dry skiving as shown in Figure 8 is possible and might be the process of choice if the Cyclocut soft cutting was already done as high speed dry PowerCutting®. However, wet skiving is still the standard process that delivers better tool lives than dry skiving. Skiving chips for wet cutting have a different formation and color than dry cutting. A comparison of dry and wet chips is shown in the photos of Figure 9. In any case, wet or dry, an all-around coating of the blade cutting edges is recommended in order to achieve optimum tool life results. Future developments will concentrate on a strictly dry skiving process without any tool life penalties compared to wet skiving. A typical Cyclocut gearset with a face width of 112mm and a whole depth of 25mm is shown after hard finishing by skiving in Figure 10. The tool life for the parts shown was 20 ring gears and 24 pinions, amounting to 640 gear slots and 312 pinion slots, which is a remarkable result compared to generally smaller numbers for skiving with CBN cutting edges. The reasons can be found in the carbide blade design and the higher stiffness between blades, cutter head body, supporting machine components, and work piece. 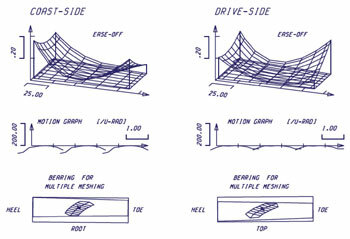 Tool spacing measurement results, surface roughness, and waviness of the ring gear are shown in Figure 11. The excellent spacing quality together with the low surface roughness and waviness values also confirm the optimal conditions of the Cyclocut skiving process. Also for Cyclocut pinions and gears, 3D measurement of flank surfaces and flank form corrections are available standard features of the Gleason metrology and correction software “G-AGE.” Smaller manufacturers often have no coordinate measurement capability available and like to rely on the tooth contact pattern appearance from roll testing as shown in Figure 12. If a correction of the contact positions is desired, the Gleason “Tooth Contact Corrections” can be utilized for a profile and face width contact movement on coast and drive side. Figure 13 shows the input screen to the left. The input values show the desire to move the contact bearing on the drive side 5mm toward the toe and 2mm toward the top. As correction target, pinion or gear for soft cutting and skiving is possible. 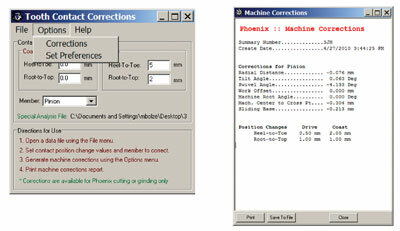 The output of the “Tooth Contact Corrections” is similar to corrections known from G-AGE, which do address the major basic settings in the Phoenix summary (Figure 13, right side). Cyclocut tooth contact corrections do not require blade modifications, which makes their execution very easy and fast. 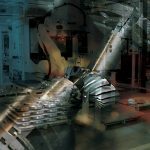 In some cases grinding is the desired or required hard finishing process. The Cyclocut flank geometry has three specific geometry features similar to other face hobbing processes. Those features are the parallel depth teeth, the constant slot width taper (which reduces the tooth thickness and slot width proportional to the distance from the pitch apex) and the epicyclical surface function of the flanks in face width direction. Figure 14 shows the face hobbed Cyclocut slot and the difference between a circular and an epicyclical lead function. The tooth depth (parallel or tapered) has no influence on the success of a grinding process. The proportional change in slot width will require grinding the convex flank with different machine settings than the concave flank (setting change in spiral angle direction). In case of grinding with a cup-shaped grinding wheel the epicyclical lead function will be replaced by a circle, which requires an uneven stock removal. 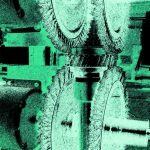 The questions are, to what extent is the uneven stock removal acceptable, and how will the changed surface lead function influence the properties of a Cyclocut gearset? 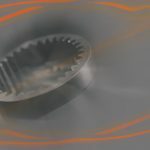 Large bevel gear sets, which are not quenched in a die, have rather large distortions in the vicinity of 0.15 to 0.3mm. In most of those cases the stock has to be removed in multiple steps by repeating the hard finishing cycle several times. The additional non-uniformity due to a circular flank lead as final surface function seems acceptable in practical cases as long as the magnitude of the non-uniformity is below the maximum permissible stock allowance. 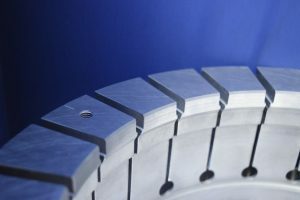 The influence of the surface function change on the Cyclocut gearset performance is minimal because of the low number of five cutter starts. With a decreasing number of cutter starts, the face hobbed lead function migrates to a circular function. The V-H characteristic in case of a 17-start cutter system would in fact change dramatically if the epicycloid was replaced by a circle. In case of five starts, the effect is negligible. 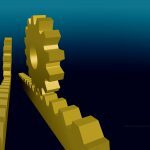 Since all other properties of the Cyclocut geometry such as parallel tooth depth and proportional slot with taper can be preserved, the remaining question is only how such a “Semi-Completing” grinding process can be realized, regarding machine settings and motions as well as grinding wheel geometry? The conversion task from Cyclocut to Semi-Completing is basically twofold. 1) A cutter head and blade geometry has to be found which first will assure a larger outside blade point radius than inside blade point radius, and secondly form flank lead curvature which are identical to the Cyclocut lead curvature at a certain point at the face width. 2) Separate basic settings for convex and concave flank grinding have to be calculated which match the slot width taper from face hobbing and minimize the surface deviation between epicycloid and circle. The changes to the cutter head and blade geometry between Cyclocut and “Semi-Completing” are shown in Figure 15 in two separate steps. Step one, from “Cyclocut” to “Step 1 Completing cutter,” requires to the outside blade (arrow tip of ROB) to a reduced radius and the inside blade (arrow tip of RIB) to a larger diameter such that the negative cutter point width from face hobbing becomes positive (see Figure 15, change from top to middle graphic). Step 1 causes a curvature radius change to ROB (larger than RIB), which would produce flank lead curvature that causes negative crowning between pinion and gear. Besides, those curvatures would also result in rather high deviations in flank form compared to the originally manufactured Cyclocut geometry. In order to re-establish the curvature radii from Cyclocut, the radii ROB and RIB are drawn under the same angle (using the vector length from the top graphic in fig. 15) with their tip pointing at the same profile point as in the middle graphic of Figure 15, resulting in two new vector origin locations (bottom of Figure 15). 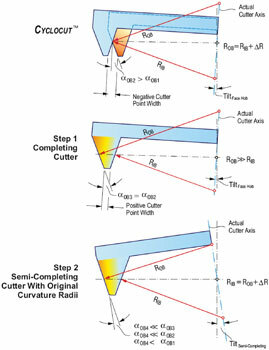 If the vector origins are connected, the new “actual cutter axis” and the tilt angle for semi-completing will be found as shown in the bottom graphic in Figure 15. It has to be mentioned that the graphics in Figure 15 are a 2D simplification of a 3D problem. The correct solution is computed with a 3D vector approach, based on the explained principle. The deviation between epicycloid and circle will be compensated for in the interaction between pinion and gear flank surfaces. They have congruent deviations, which cancel out the differences in the tooth contact and ease-off. Regarding the non-uniform stock removal between soft machining with face hobbing and hard finishing with face milling, the knowledge about the deviations is still an important basis for the minimization of the difference between epicycloid and circle or as a guideline for the required case depth in the heat treatment process. 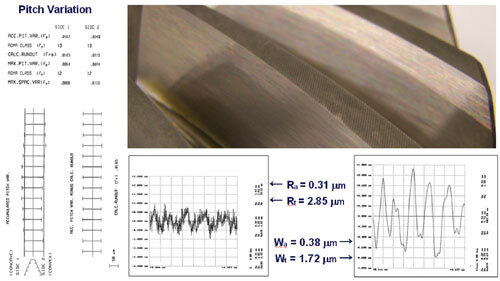 The pinion flank form deviations (soft manufacturing to hard finishing) have been calculated and graphically shown in Figure 16 for the same sample gearset, which has been used throughout this paper to demonstrate the Cyclo-Palloid conversion to Cyclocut with tooth contact analysis (TCAs). The optimal cutter radius is calculated from the epicyclical curvature in mid-face. 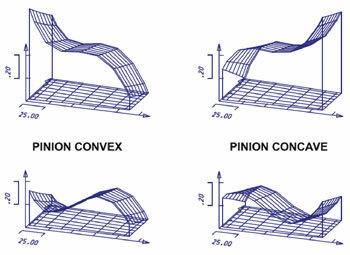 The two graphics on top of Figure 16 show the pinion convex and the pinion concave deviations if the spiral angle is matched in the center of the face width. A considerably better surface match was found in the lower two graphics of Figure 16. Since the epicycloid has a constantly increasing radius of curvature from heel to toe, it is possible to find a spiral angle match about 25 percent of the face width away from the heel, and at the same time a spiral angle match 25 percent of the face width away from the toe. If the radial setting, which dictates the spiral angle, is calculated from the epicyclical kinematic from those two positions, then the average value of the two slightly different results will always lead to the optimal match conditions. The Gleason Semicom software automatically calculates the optimal settings for minimum deviations, and therefore minimized stock variations during the hard finishing process. 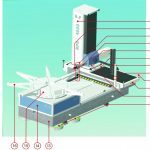 For the final conversion of the Cyclocut basic settings, as well as cutter head and blade specifications, pinion and gear are developed with mirror image generating gear specifications (basic settings). This reduces the influence of different kinds of side effects, like diamond contact bearing in case of highly asymmetric outside and inside blade angles. The result of the Semi-Completing conversion of the example gearset used in this paper is shown in the tooth contact analysis (TCA) results in Figure 17. Bias direction of the tooth contact and motion graph compare well to the original Cyclo-Palloid analysis. The curved path of contact and the twisted Ease-Off topography (on top in Figure 17) are the result of cutter tilt and machine setting adjustment in order to accomplish the conversion task. • Contact optimization as required. 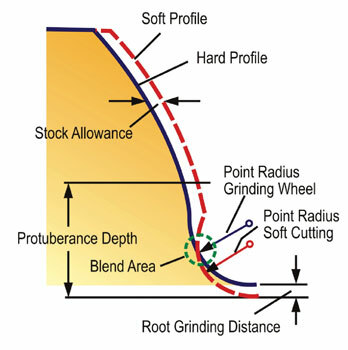 The restrictions in tooth contact development may seem low because of the single side freedoms a Semi-Completing process offers, but it has to be considered that in contrast to a fixed setting process, a single grinding wheel is used to grind both convex and concave flank. 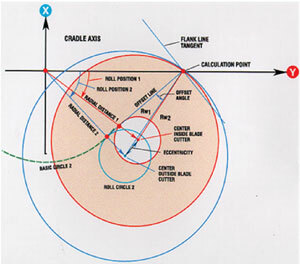 The grinding wheel point width is defined by the inner slot width and the mean radius was derived from the midpoint of the epicyclical kinematic in order to minimize the deviations between epicycloid and circle. Also the radial distances for the two setups for convex and concave flank grinding are predetermined to minimize the deviation in Figure 16. The final freedoms, cutter tilt combined with tool profile angle changes as well as tool profile curvatures, are used to accommodate the correct effective length and profile curvature. 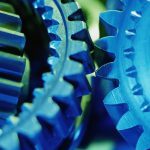 Since the setups of pinion and gear are basically mirror images, the tooth contact will always be central as desired. The exception of the mirror image setups is the case of previously optimized Cyclo-Palloid or Cyclocut designs. The flow chart in Figure 18 (see pg. 49) shows the different possibilities of data input. 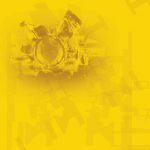 The soft machining process could be performed using Klingelnberg Cyclo-Palloid, Oerlikon Spiroflex/Spirac, or Gleason TRI-AC® designs. 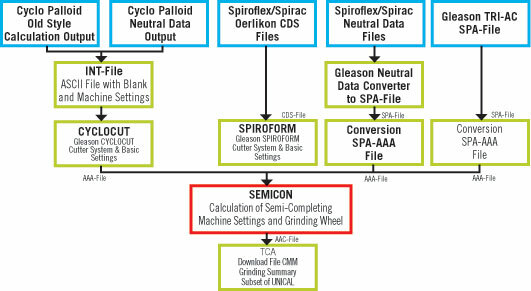 Software modules like Cyclocut and Spiroform convert the input files into Gleason basic machine settings and tool definitions. The processed Cyclocut, Spiroform, and TRI-AC can either be used for soft cutting and hard skiving or for soft cutting only. 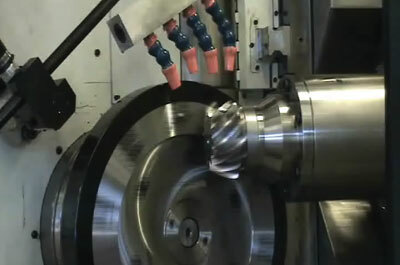 In the second case, grinding is possible as the hard finishing process after Semicom converts the face hobbing-completing data into face milling Semi-Completing data. It is an important task of the conversion to minimize the non-uniformity of stock removal due to the difference between epicycloid and circle. One grinding wheel with outside and inside profile definition and two sets of basic settings are generated by the Semicom software. The grinding stock is removed on the convex flanks and the concave flanks in two separate passes, which can be accomplished in a “up-roll -> convex, down-roll -> concave” grinding. In cases of large bevel gear grinding with high amounts of stock removal, the single side grinding can be viewed as an advantage that contributed to high accuracy, good surface finish, and the avoidance of thermal material damages. * Cyclo-Palloid® is a registered trademark of the Klingelnberg Corporation. Phoenix®, PowerCutting® and TRI-AC® are registered trademarks of The Gleason Works.